On September 26th,1969 Pye Records released Status Quo's 2nd Album "Spare Parts" in the UK. By late 1969 the band were on a downward slide. Without a full-time manager and rapidly running out of places to play, the band had begun to appear in public wearing jeans and projecting their scruffy look. This was also the birth to the "heads-down no nonsens boogie-rock style" and the band changed their setlist drasticly. Most of the songs from the "Ma Kelly Greasy Spoon" album were written at this time. Set List 1970: Junior's Wailing / Down the Dustpipe / Need Your Love / In My Chair / Spinning Wheel Blues / Shy Fly / April Spring, Summer and Wednesday / Is it Really Me / Gotta Go Home. 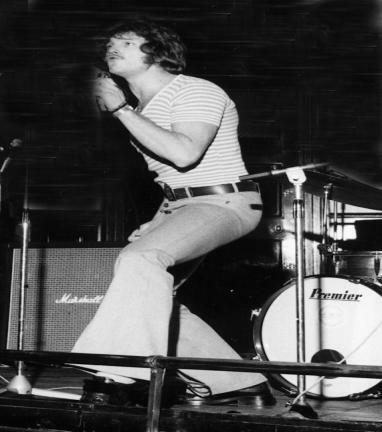 14.1.1970 - Support act The Verge played with Status Quo at the Cavendish in Edinburgh. About supporting Quo they wrote on their website: "After the gig the Quo asked us to meet up at their hotel, the Royal Stuart in Glasgow. They said they were really impressed with our set and told us they would like to manage us, though as we found out later it was Alan Lancaster who was most keen on going into management. After a couple of months we hadn't heard anything so I went down to London and met Alan at his mum's house in Peckham and he told me he was still very much interested and was trying to put a few ideas together with Max Clifford, a relatively unknown PR man at that time but as it was a bit difficult for them to arrange anything for us while we were based up in Glasgow, we were to come down to London and try the club experience down there." 22.3.1970 - Quo on the bill of the "Record Star Show" at Wembley Empire Pool. Also performing: Kenny Ball, Blue Mink, Lou Christie, Dave Dee & David, Edison Lighthouse, Harmony Grass, The Ladybirds, The Marmalade, Vanity Fare and Roger Whittaker. 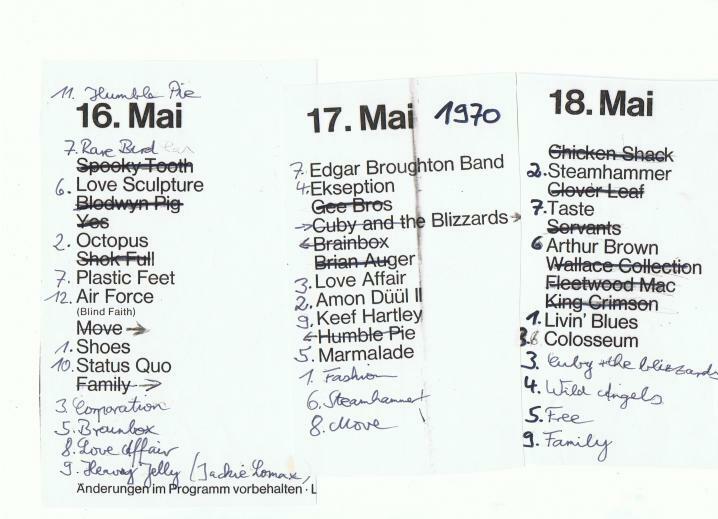 10.7.1970 - *Quo played the famous "Euro-Pop AZ-Musikfestival" 1970 in Munich, Germany - Olympia Eissport Stadion Am Oberwiesenfeld. Setlist: Junior's Wailing - (April) Spring, Summer & Wednesdays - Roadhouse Blues - Down The Dustpipe. This slightly distant but decent audience tape for the period that gives a good idea of what it was like. Check the samples to see if it passes your test. As short as it is, this is presumably the entire set, as their scheduled slot was only from 7:15-7:35 PM. The band came out & put out - crunchy & rockin'. Crank 'er up! July 10th: Krokodil [6-6:20 pm] Mighty Baby [6:30-7:30 pm] Status Quo [7:15-7:35 pm] Brinsley Schwarz [8:00-8:30 pm] Hard Meat [8:45-9:15 pm] East Of Eden [9:30-10 pm] Black Sabbath [10:15-11 pm] Edgar Broughton [11:15-12 am] Taste (featuring Rory Gallagher) [12:15-1:15 am] Juicy Lucy [1:30-2:15 pm] Jody Grind [2:30-3 am]. July 11th: Out Of Focus [5:30-6 pm] Van der Graaf Generator [6:15-6:45 pm] Amon Duul II [7-7:30 pm] Atomic Rooster [7:45-8:15 pm] Savoy Brown [8:30-9 pm] Free [9:15-9:45 pm] Steamhammer [10-10:30 pm] Traffic [10:45-11:45 pm] Deep Purple [12-1 am] Black Widow [1-1:45 am] Bronco [2-2:30 am]. In the early summer of 1969 I went down to Croydon to see Status Quo at the Greyhound. 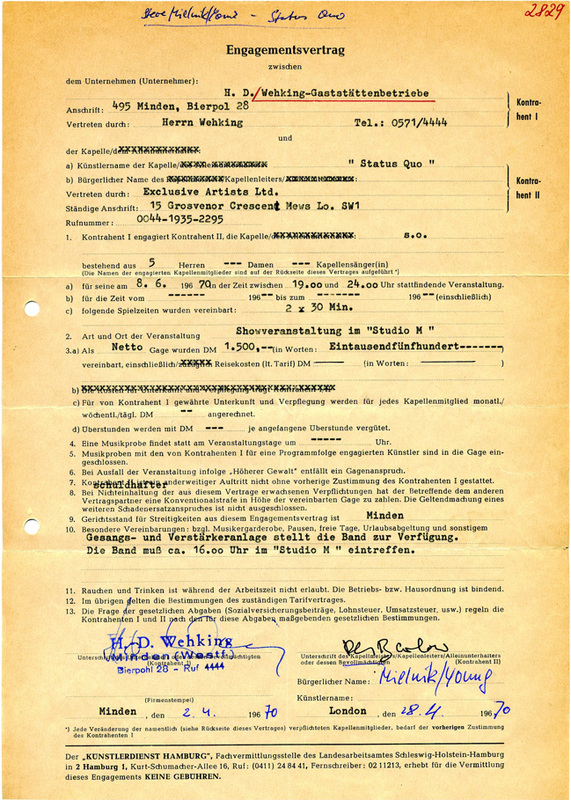 At that time I lived with my mother in Gravesend/Kent and my dad was stationed with the British Army in Bielefeld, Germany so I travelled back and forth from England to Germany. Having seen The Quo for the first time live, I really enjoyed the gig and believed in the bands potential. After the show I asked for a contact address and I was given the details of Gaff Masters Agency in London. In Germany I worked as a DJ in the biggest Disco and Youthclub in Bielefeld. There I was in charge of booking international Rock and Popbands. The Jugendheim Niedermühlenkamp” has a capacity for approx 900 people. Bands from Germany, Holland, UK and even the USA where performing there, such as Free, Steamhammer, Uriah Heep, Love Affair, The Schocking Blue, Golden Earing and many more. I decided to book Status Quo. It was a great concert and after the gig the stage was set for the beginning of a great friendship and working releationship with the great Rock’n Roll Circus called STATUS QUO. The night before the gig I had to deliver some German money to the Zentral-Hotel Bielefeld, where the band were eagerly waiting for the “bread”. They were absolutely broke. Well… now they could order and pay their food and drinks. The next shows were in Emsdetten and Venlo, Holland. I decided to stay with the band. Before they went back to the UK, we had a meeting in a Dutch Hotel, where I was asked if I would like to work closer with the band. They appreciated what I’d done for them and I thought I could be a very keen booker on the Continent. A year later they wanted me to work in England too, well I had got married in January 1970 and my wife was pregnant, so I couldn’t go, but I could stay in Bielefeld and so I booked lots of gigs in Germany for the group. Promoting a Rockband in Germany was easier said than done at that time. That was the time of Psychadelic and so called Progressive Rock, who snubbed bands like QUO. I really believed in the band and so I carried on promoting them with tireless enthusiasm. I remember how the band were sometimes a bit drepressed and disappointed about the scene in the UK. The pay was quite low for live bands, so they really enjoyed being able to play in Germany as the fees were better and there were plenty of Discotheks and clubs to play in. I didn’t tell them how difficult it was for me promoting a band of their “style” at the time – it took a lot of work. Phoning and driving was very expensive. Only enthusiasm and understanding from my wife Christa helped me to carry on. Business was booming though and I booked a lot of gigs, signing sessions and Radio shows. The signing sessions were often extremely embarrassing as nobody wanted the autographs. Unfortunately I was unable to help Quo onto the next level and, as things improved a little following the university things, they eventually had the good fortune to end up with MAMA Concerts, one of Germany’s top promoters. Status Quo was an important part of my life, which I wouldn’t like to miss and they know they have also benefitted from my personality and work. It’s no wonder, that the name Status Quo has always been present in the Bielefeld area where I lived. Also later when I worked as a radio DJ in the mid and northern parts of Germany, between Köln – Bremen and Hamburg. When I received the advance copies of their LP’s or Singles, I was always the first to play it on air in Germany. I met Status Quo after 24 years on their “Don’t Stop” tour in 1996 in Bielefeld again. Francis introduced me to his sons Nicholas and Kieran, who where supporting Quo with their band Little Egypt. Well… history was repeated a little bit that night, because after the show I agreed to book some gigs over here in Germany and we had some great times together. Several years ago I became a Riding master and judge for horse competitions in dressage and showjumping by the german national ridding society. I also work freelance for a printing firm and a design agency as DTP and Multimedia designer.I now live on the country side between Bielefeld and Detmold, Germany.